Is Gold a Good Investment Strategy? Gold has been in the news a lot lately. It’s 52-week high, as of this writing, is $1,804 per ounce. However, the price of gold has since plunged to a 52-week low of $1,323 per ounce. As of this writing, gold is right around $1,395 per ounce. To many investors, this is a sign that it’s time to buy, before gold sky rockets higher again. Others, though, are more skeptical of whether or not gold is a good investment strategy. 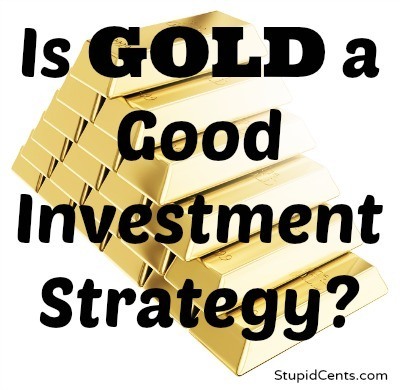 So, is gold a good investment strategy for you you? Like so many questions of finance and investing, it largely depends on what you plan to do with the gold, and what your particular goals are. One of the biggest reasons that some people like investing in gold is due to the fact that it is a tangible asset. Gold, when you buy bullion or coins, can be held in your hands. You can’t hold a stock or bond in your hands. With gold, there is something tangible that makes it desirable to some people. Gold can be used as money as well. Certain gold coins can be used as legal tender in different states, and that can be a bonus as well. If the value of the dollar continues to erode, being able to use gold as currency appeals to some. And, because gold is denominated in dollars, as the greenback’s value erodes, gold becomes more valuable. One of the reasons that gold is thought to be a good investment strategy is due to the fact that it is a hedge against inflation. If hyperinflation sets in, and if the bottom completely drops out of the economy, some investors think that having gold will be a major advantage. Of course, there are some drawbacks to investing in gold. First of all, nobody can truly predict what is next for the economy and for the markets. As a result, there is the possibility that gold prices will drop, rather than rise further. Another consideration is that when you buy physical gold, you pay a premium for it. Often you pay higher than market value to buy physical gold. You also need to figure out how to store it. You can pay someone else to store it on your behalf, but then it isn’t readily accessible. You can store it on your own premises, but then you have to worry about theft. Finally, physical gold is taxed at the collectible capital gains rate. Increases in the value of physical gold are currently taxed at 28%. Unless your physical gold collection is in the form of jewelry (known as an “heirloom collection”), you are expected to pay taxes on your gains… and they may even be at a higher rate than your current marginal rate. Many investors who think gold is a good investment strategy because it stands a good chance of appreciating in value aren’t interested in physical gold. Many of them invest in gold stocks or gold ETFs. This way, they can be exposed to gold, without actually owning it. What do you think? Is gold a good investment strategy for your situation? Much too volatile for me. I never thought this was a good way to go and if I did I would only invest say 5% of my portfolio, at most. So why bother with this complicated investment?